Late in 2009 my friends Deny Brigance and Rick Marksberry decided it would be great to put out a Christmas CD featuring musicians that played at the Jesus House. So they challenged everyone to write at least one Christmas song. The hardest part of songwriting is determining what message or scenario you want the song to convey. I'm told there are two types of songs; Picture songs such as Christopher Cross's Sailing or Don Mclean's song Vincent paint a picture. The second type is message songs. These can be love songs that express a persons feelings in words or songs that express a writers' feelings about other things. The song that I wrote falls into the latter catagory. When I was a kid we had great fun at Christmas. We had Christmas break from school. We had Christmas parties. We had Christmas decorations throughout school and throughout our town. We sang Christmas carols at school. We had Christmas plays. Christmas was not taboo. I only knew one Jewish kid in high school and his family didn't seem to mind. There were two sisters in my fifth grade class that could not participate in the Christmas party because their parents were Jehovah Witnesses. The family voiced no objection to the Christmas party. But in these modern days any hint of Christmas at a public forum or public school is grounds for a lawsuit. The separation of church and state has gone to a whole new level. Subsequently the word Christmas is outlawed as it is offensive to aetheists, Muslims, Pagans, Wicca and other groups that believe the word Christmas will cause our children's minds to become corrupted with ideas about God and His Son Jesus. So we now have Holiday Season. The children are off on Holiday break. No songs about Christmas. Frosty the Snowman, Down through the Chimney, Jingle Bells and other non threatening, no mention of God or Jesus songs are OK to be sung in public schools. But sing the First Noel, Silent Night, O'Come All Ye Faithful or Hark the Hearld Angels Sing and the ACLU will send a pack of rabid attorneys to sue your school or town. Christmas has been the most sacred day in Christian history. The earliest recorded calendar of Christian feast days dates back to 243 AD. So we know it has been celebrated in one form or another for 1767 years. 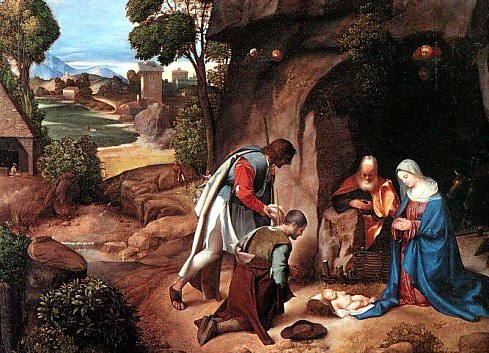 There are criticisms that Christmas Day was not actually the date of Jesus' birth. December 25 was a Pagan holiday celebrating the solstice. Perhaps the early Christians were aware that non-believers were celebrating and they too wanted to have fun without worshipping a tree or a pole or an idol. So they chose that time of year to celebrate the birth of Jesus. 'makes sense to me. With that said, here is my song which in a way gently reminds non-believers that Christmas is more than just a holiday. it's the day that Jesus came into the world. to celebrate the coming of the Lord. I don't want to hurt no one on this Noel. Diversity is smiled upon so show me some respect. I'll acknowledge your traditions, allow for mine as well. now you want to change it's name. Listen to me please. to commemorate the birth of God's own son. Even if you don't believe there's those of us that do. I would never disrespect you, please respect me too. to celebrate the birth of God's own son this holy night.